Does your business accept checks? Let TransGate Solutions help you turn the complications of check acceptance (driving to the bank for deposits and worrying about the check bouncing) into a solution as easy to manage as accepting credit cards. For face-to-face transactions, Point of Sale Conversion enables merchants to process checks electronically ... just like a credit card. Run the check through our equipment and have it deposited to your bank account the next business day, saving you the drive to the bank. Merchants receive payment quickly via electronic deposit of the funds into their bank account. Capitlize on the same benefits of Point of Sale Conversion while gaining protection from bad checks with Guaranteed Funding. All conversions include verification screening against a national negative database. Both solution inclued web based reporting which provides full transaction tracking with many features and allows you to reconcile billing, view statements, transaction history, and gain fast access to batch detail and much more. 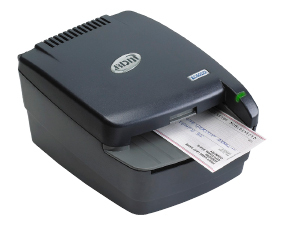 Operates on almost all credit card terminals with a check reader or imager attached. A web based virtual terminal can be used in place of a physical terminal.